Lesley-Ann Brown-Henderson, Campus Inclusion and Community director, discusses Black House renovation plans at the Community Dialogue. Brown-Henderson said they have moved from the “feasibility” part of the plan to the “schematic design” phase. Administrators are asking for feedback from students regarding projected plans for Black House renovations. 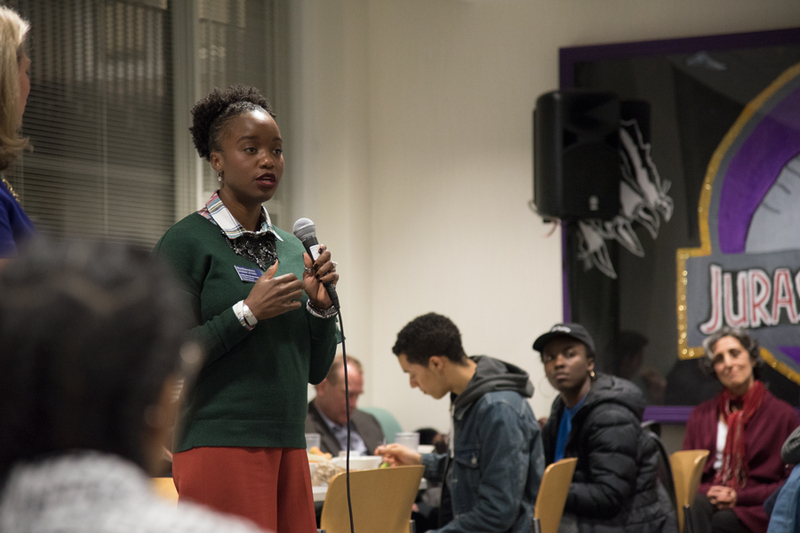 The announcement was made at a community dialogue event Wednesday, which brought together more than 50 students, faculty and administrators to discuss updates on University initiatives including the renovations, Books for Cats and the Black Student Experience Task Force. Steering Committee co-chairs Lesley-Ann Brown-Henderson and Julie Payne-Kirchmeier announced that the committee, which will oversee the Black House renovation, has moved from the “feasibility” part of the renovation plans — where students discussed what the ideal Black House would look like to them — into the “schematic design” phase. In this phase, the committee is putting “bricks and walls” to students’ ideas for the house to see what it would actually look like, Brown-Henderson said. Brown-Henderson and Payne-Kirchmeier said the committee will launch a website tomorrow for the “engagement” phase, which will allow students to submit feedback on projected plans for the renovations and the spaces they would prioritize in the Black House. Students can also attend two live presentations, on Feb. 12 and Feb. 15, to learn more about the plans and share their feedback, they said. “What we really want from (students) now is to get engaged in this process these next two weeks,” Payne-Kirchmeier said during the dialogue. After the schematic design is complete, the committee will meet Feb. 26 to work with the architects to put together a design based on student suggestions and committee discussions. Payne-Kirchmeier said they are expecting this step to be complete April 2018. Also at the dialogue, associate provost and chief diversity officer Jabbar Bennett discussed progress that has been made in three main areas for the Black Student Experience Task Force report recommendations, including increasing the number of black students, faculty and staff on campus, listening to black students regularly and creating a “physical academic hub” for black students on campus. These areas were identified by 75 administrators and faculty as initiatives that need to happen campus-wide level, Bennett said. So far, progress in these areas has included creating the Academic Support and Learning Advancement center in the library. The task force has also formed five groups —which include 39 students, faculty and staff — to work on listening to black students regularly, not just in times of crisis. The goal, Bennett said, is to have a concrete implementation plan for each of these three recommendations submitted to leadership by the end of Spring Quarter. Brown-Henderson, executive director of Campus Inclusion and Community, also mentioned she has heard concerns over the current vacancy of four positions at the Multicultural Student Affairs office. MSA director, one of the vacant positions, will be filled by Daviree Velázquez Phillip on Feb. 12. Lee West, director for undergraduate education, provided an update on Books for Cats — an initiative started this year to provide first-year, low-income STEM students with textbooks for certain classes. The program has expanded from including 14 classes Fall Quarter, to 24 classes this quarter and 29 classes next quarter, West said. More than half of the eligible students in these classes are taking advantage of the program, West said. The program is looking to potentially expand to include online homework services and a wider array of lab materials — it currently provides some materials for chemistry courses. Several students proposed factors to consider when expanding the program, such as the use of course packets and test preparation material. “There’s a lot of work being done to reach the right people to make sure that students have the experience where they pay for their classes when they pay for tuition, but also can afford to take their classes,” Isaac told The Daily. Events related to the 50th commemoration of the Bursar’s Office Takeover were briefly mentioned toward the end of the dialogue, but students were unable to participate in a discussion about the Takeover since the dialogue was already running past the projected end time. A few students, including NU Quest Scholars vice president Madisen Hursey, raised concerns over the format of the dialogue, which consisted mostly of faculty and administrators giving updates about campus initiatives without leaving time for student discussion and feedback. Patricia Telles-Irvin, vice president for Student Affairs, said during the meeting that administrators are trying to reach a balance between giving updates and students providing feedback, and while they might have been “off-balance” at the dialogue, they wanted to “make sure students knew (administrators) heard them” and that they were being clear with the actions taken. Hursey said she appreciated the updates, but felt there could’ve been more time for student comment. This story was updated to clarify that Books for Cats is looking to potentially offer more lab materials but already covers some materials for chemistry courses.